Climb aboard Fort Ticonderoga&apos;s ground transportation to approach the tactical challenges faced by generals such as Abercromby, Burgoyne, Amherst, and Gates. Led by Fort Ticonderoga&apos;s Interpretive Department staff, play out the general&apos;s decisions as you tour the historic hills surrounding Ticonderoga and place yourself in their shoes to see if they played their hands well as they vied for Ticonderoga - the key to the continent. Tour stops include Fort Ticonderoga, Carillon Battlefield, Mount Hope, and Mount Defiance. This 90-minute tour is scheduled for July 8, 15, 22 and 29; and August 5, 12, 19, and 26. Tours begin at 6:30 pm and tickets are $65 per person. Experience the flash of musketry and roar of cannon fire by night in this unique 90-minute tour of demonstration of 18th-century guns, big and small! Explore the workings of the firelocks and cannon that armed the many garrison of Fort Ticonderoga and influenced the shape and strategic importance of this important frontier citadel. The tour concludes with a dramatic nighttime demonstration of weapons that you will not see anywhere else! The Guns By Night is scheduled for July 3, 10, 17, 24, and 31; and August 7, 14, 21, and 28. Tours begin at 8 pm and tickets are $35 per person. Join Fort Ticonderoga&apos;s Curator of Collections for a rare look inside the building where the preservation of Fort Ticonderoga began and learn about the exciting new research that is challenging long-held assumptions about the building&apos;s past. Built in the 1820s and 1830s, the home is recognized as one of America&apos;s most important historic houses and is a critical part of Fort Ticonderoga&apos;s preservation and restoration story. The tour examines the building&apos;s evolution and history chronicling its many changes over the past 188 years and explores the structural story within the walls that have given new clues into its past. The 2 hour tour begins at 1 pm at the Guest Service Desk at the Log House Welcome Center. Tours are scheduled for July1, 8, 15, 22, and 29; and August 5, 12, and 26. Tickets are $35 per person. Visit Fort Ticonderoga by night and venture into the darkness to learn about the unexplained experiences reported by staff and guests over the past century and decide for yourself if they are connected to the Fort&apos;s remarkable past. A museum staff person will serve as your guide on this 90-minute exploration of the Fort&apos;s darkest and reportedly most active areas and provide a rare insight into a unique and not well understood aspect of Ticonderoga&apos;s history. Tours are scheduled for July 2, 9, 16, 23, and 30; August 6, 13, 27; and October 10 and 24. Tickets are $40 per person. Located on Lake Champlain in the beautiful 6 million acre Adirondack Park, Fort Ticonderoga is an independent not-for-profit educational organization, historic site, and museum that ensures that present and future generations learn from the struggles, sacrifices, and victories that shaped the nations of North America and changed world history. Serving the public since 1909, Fort Ticonderoga engages 70,000 visitors annually and is dedicated to the preservation and interpretation of Fort Ticonderoga&apos;s history. Accredited by the American Association of Museums, Fort Ticonderoga offers programs, historic interpretation, tours, demonstrations, and exhibits throughout the year and is open for daily visitation May 10 through November 2, 2014. The 2014 season features the Fort&apos;s newest exhibit Founding Fashion: The Diversity of Regularity in 18th-Century Military Clothing which brings together for the first time the museum&apos;s wide variety of important 18th-century clothing, related artwork, and archeological fragments to illustrate the diversity of clothing worn by the armies who served at Fort Ticonderoga during the French & Indian War and Revolution. Visit www.FortTiconderoga.org for a full list of ongoing programs or call 518-585-2821. America&apos;s Fort is a registered trademark of the Fort Ticonderoga Association. 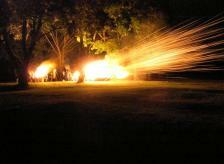 Photo: Thrill at the power of artillery at Fort Ticonderoga&apos;s popular Guns By Night Program this summer!